NWPGCL Job Circular 2019 with Viva Exam Notice Or Career Opportunity Available Now. “NWPGCL” Full Meaning North West Power Generation Company Ltd. BD Nwpgcl New Job circular Published By The Electricity Generation Authority. Bangladesh Power Development Board Enterprise Asking Energic and Skilled Person For immediate Appointment on Contractual basic to the Following Vacancy Position. For The Post, Only Bangladeshi Citizen Can Apply. So See Below Wzpdcl job circular Application form Download. Hello bd Company Job Circular Follower, NWPGCL New Notice Candidate Can Download Bangladesh Power Generation Company Ltd Job Exam Routine or Results in Edujobbd.com. 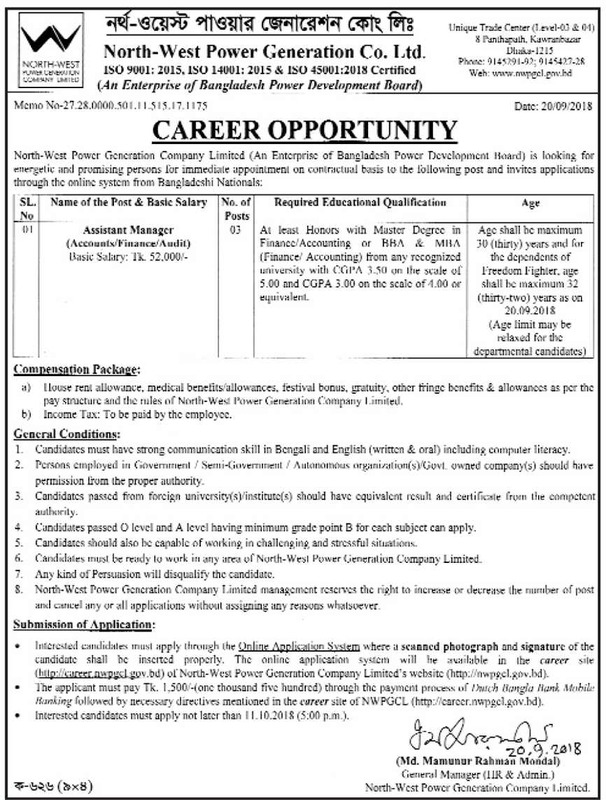 In here Also Available north-west zone power distribution company ltd job circular 2019, Bangladesh china power company ltd Career Opportunity Notice. Department Name: North West Power Generation Company Limited (NWPGL). Job Type: Non- Govt job. Post Name: Executive Director (Planning & Development). Source: The daily star E-paper. Application Published Date: 20 September 2019. NWPGL Job Salary: 52,000 – 70,000 Taka. Application Fee : 1,000 Taka. Application Last Date: 11 October 2019. To Get Any Further Information ABout nwpgcl Company circular 2019, Then Check Our Site On Google. Because Edujobd.com Publish Daily based latest and Hot job circular news For bd Job Seekers. To get all types job circular news 2019 such as government jobs, private jobs, international jobs, bank jobs, Ngo Jobs, Defence Job, Prothom Alo Jobs, Part-time Job, Full-time Job, All Jobs Newspaper, Weekly Job Circular E-paper, public exam or private exam result, SSC Results, HSC Result, JSC Results, PSC Results with Marksheet, MA exam suggestion, career guideline, etc. Our main purpose helps the jobless for their Bright future and we Believe that our published Dhaka job recent Notice help the who is finding deserve the job. We also give careers tips to anybody. For seeing more update visit Our Website as well as like our Facebook page Chakrir Khobor and National University Updates. Thanks For Stay.